But he left the Russia investigation – which is also reportedly now looking into whether Mr Trump has attempted to obstruct justice – in 2017, citing a potential conflict of interest, and handed control to his deputy, Rod Rosenstein. “I’m very disappointed in Jeff. Very disappointed,” Mr Trump said during Tuesday’s interview about Mr Sessions’ decision to leave the investigation. 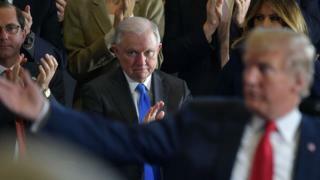 Mr Trump also told Hill.TV that he was “not happy” on immigration and other issues, and said Mr Sessions had performed “very poorly” during the nomination process for the post of attorney general. What has Trump previously said about Sessions? This is not the first time Mr Trump has publicly criticised Mr Sessions. Last month, Mr Trump accused the attorney general of having failed to take control of the justice department. Mr Sessions rejected the president’s remarks, saying: “While I am attorney general, the actions of the Department of Justice will not be improperly influenced by political considerations.